Rui Prada, born in Lisbon, Portugal, in 1976. Ph.D. in Computer Science from the Instituto Superior Técnico -Technical University of Lisbon (IST-UTL). Assistant Professor in Computer Science at IST-UTL and Senior Researcher at INESC-ID in the Intelligent Agents and Synthetic Characters Group (GAIPS). 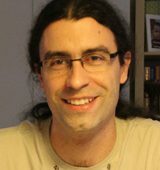 What concepts are needed and how they are integrated in a computation model to simulate the emergence of gender differences in social situations? The aim is to define a conceptual computational model that includes different concepts from social sciences, such as social power, status, reputation, social identity, self-esteem, emotions and gender in order to simulate rich social situations with virtual humans (autonomous agents), with particular focus on the exploration of the emergence of differences in gender. The model will be used to develop simulations of child play during my stay at NIAS. But, it will also be used as a roadmap for future research in the field on social intelligence for autonomous agents. 1) Iolanda Leite, André Pereira, Samuel Mascarenhas, Carlos Martinho, Rui Prada, Ana Paiva: “The influence of empathy in human-robot relations” in International Journal of Human-Computer Studies, vol. 71 (3), pp. 250-260, January 2013. Elsevier. 2) Samuel Mascarenhas, João Dias, Rui Prada, Ana Paiva: “A Dimensional Model for Cultural Behaviour in Virtual Agents” in Applied Artificial Intelligence, vol. 24 (6), pp. 552-574, July 2010. Taylor & Francis. 3) Rui Prada, Ana Paiva: “Teaming Up Human with Synthetic Characters” in Artificial Intelligence. Perrault, C. R.; Cohn, A. G. (Eds.). vol. 173 (1), pp. 80-103. 2009. Elsevier.